The BillyOh Garden Hyper Store is a gardener’s dream! 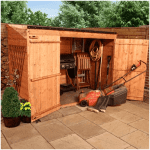 Incredibly spacious, this attractive wooden shed will be large enough to hold even the biggest collection of outdoor and garden equipment. 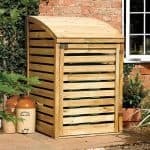 An excellent buy at a fantastic price for the enthusiastic gardener or a family with lots of items to store. Wow, this is superb deluxe storage! Constructed from square edge wooden board for roof and floor it is durable and hard wearing, the tongue & groove cladding give it extra strength. 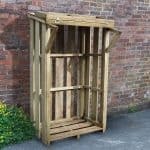 The roof is felted so this is a weatherproof choice for your garden storage and the large double doors mean easy access to all your garden paraphernalia. Ideal for many garden spaces and good looking enough to be an attractive addition to the outdoors. From trampolines to bikes and garden seeds to power tools, store it all in one place with the extra wide doors making your items easily accessible at all times. With a durable exterior, your items will be protected year-round from the elements and from rust, damp and mould, keeping them dry, clean and in tip-top condition. If you are looking for the ultimate storage solution for your items then look no further that the Garden Hyper Store – you can have it all and at a great price to match! 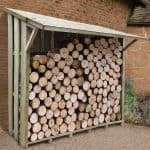 When looking at various garden sheds during the decision making process preceding a purchase, it’s not always clear whether a particular model will suit your particular storage needs. Below, the whatshed.co.uk team identify and discuss various features that make this particular shed stand out from the rest. 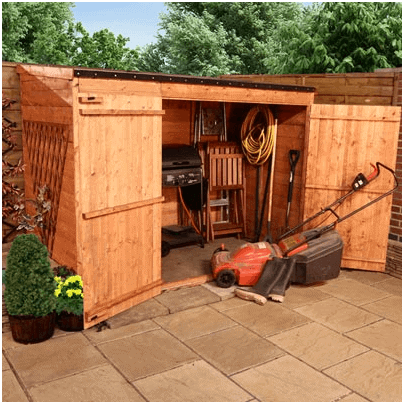 Exterior: This shed has an attractive exterior which will complement existing furniture if you wish to make a feature of it, or likewise will blend into its natural background if you wish for a more subtle appearance. The unique pent roof and warm-toned tongue and groove cladding provide a great aesthetic as well as a strong and durable build to protect your items from the elements. 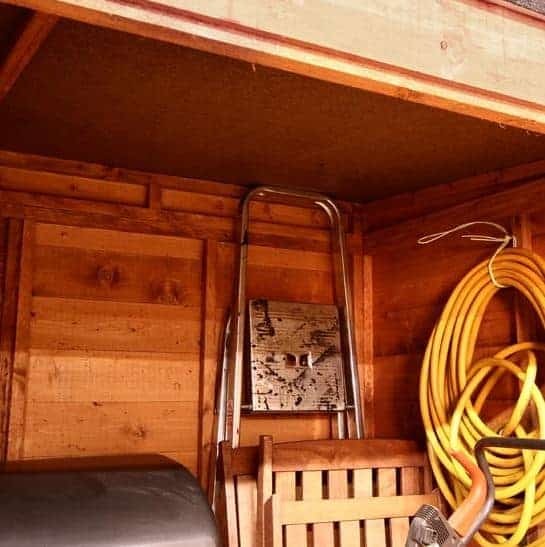 Interior: The interior of this shed provides a spacious floor area in which you may store a range of garden and outdoor items, including bikes, garden furniture and outdoor toys. Additional storage space for smaller items such as tools and accessories may be added in the form of freestanding shelving, built-in shelving or hooks. Doors: The extra wide double doors open to allow the full interior to be seen from the outside. Particularly suitable for storing larger items and for getting bikes in and out on a regular basis, the doors ensure that your items remain easily accessible at all times. 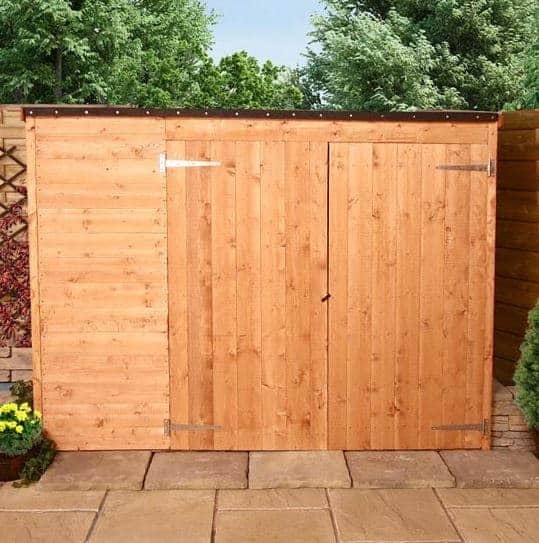 Security: Security fittings are not provided with this particular shed, however the doors provide a suitable surface for a strong padlock or similar security fitting. These may be purchased independently at a modest price, giving you peace of mind that your items are securely stored away. Painting your shed: If you would like to paint your shed to add the personal touch or to match other items within your garden area then that is easily done. The BillyOh Garden Hyper Store: How easy to build? Building the Garden Hyper Store couldn’t be easier with the easy-to-follow instruction manual included; clear instructions and easy-to-read diagrams make the assembly process as smooth as possible. 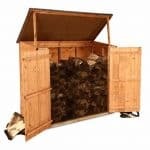 Your package will include everything that you will need to put your shed together. You will need to provide a basic tool kit for assembly, but all the panels, roof and floor material, screws, nails and fittings will be provided within your package. Although two-person assembly is recommended for safety reasons, one-person assembly is made possible by the smaller and easy-to-handle nature of the parts. We expect that construction will be completed within two hours. The BillyOh Garden Hyper Store: What is the overall quality like? BillyOh design and manufacture a superb range of garden and outdoor buildings within the United Kingdom. Their products are of an exceptional quality and will be still featuring within your garden in many years to come. 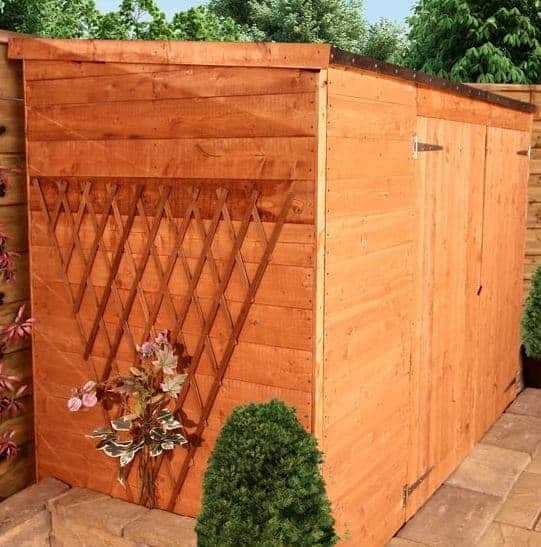 Made from thick, durable timber, the Garden Hyper Store is finished to provide the ultimate protection for your items whatever the weather. Come rain or snow, season to season this shed will protect your equipment from damp, mould and rust, keeping them dry and secure at all times. With virtually no regular maintenance required, to clean simply hose down or sponge clean with water. The high quality timber is pre-treated to maintain its warm toned wood colour over the years, meaning it will still look as smart in five years’ time as it does today. With this model you will be able to store your items knowing that they are being taken care of. A super storage solution for all of your outdoor activities. 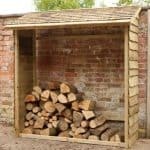 If you are a keen gardener then pottering about in here could be a dream, with space for all of your gardening tools and accessories, it will keep your items dry and secure, all year round. For a family, the Garden Hyper Store is a superb way of keeping your garden neat and tidy with all of your bits tucked away safely inside. I had been searching for a decent size storage unit for a couple years. When I am looking for something that is a big purchase, I take my time. I am glad I was very hesitant on anything else because the Billyoh Garden Hyper Store that I purchased was worth the wait. I got more than what I paid for. The material is very durable and long-lasting. Not to mention it being weatherproof. There is usually a lot of rain where I live so I was worried about it rotting, etc. but it’s actually holding up fine. The size is perfect for all of my belongings that I store in there. There is no doubt that the main reason for my purchasing this shed was the size. I do commercial gardening and lawn cutting as well as landscaping and my neighbourhood is not the worst but I’ve has equipment pinched off the truck. So, since I have a side entrance, I can back the truck in and deliver the equipment to the shed. The doors do open as wide as the ones in the picture and there is certainly no space issues. One word of warning though, if you aren’t handy with construction then you may want to go to the Home Base and see if you can employ some professional help which will cost less than if you abort the plan yourself. This is the quintessential storage unit if you ask me. This was the best storage unit I have ever owned. I’ve collected some stuff over the years and will confess that mine is not really full of gardening gear. However, for the price and the space, it’s fantastic. It’s also great to my plastic storage bins. I can stack them to the top and still have room to move around.